Walsine Pierce: GUNNER: No figment of the imagination! I've had my new dog, Gunner, for four weeks now. As I haven't written about him or taken him down to meet the family at Mansfield, my son, Mark, said he thought the dog was just a figment of my imagination. Does this look like a figment of the imagination, Mark? Gunner, a three-year-old Giant Schnauzer, was a gift to me from my nephew, Jimmy Pierce. 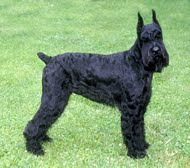 Jim had done some shopping for me and I was down to southern Ohio to pick up the items and admired his beautiful, black Giant Schnauzer. I explained to Jim that I had wanted to get a Doberman Pinscher while Julie wanted a third Airedale Terrier. An Airedale Terrier is a wonderful "watch" dog but I felt the need of a "guard" dog. We compromised on a Giant Schnauzer. In the late 1700's the German butchers and brewers needed a more agressive dog than their Standard Schnauzers. They cross-bred one half Schnauzer, a quarter Great Dane and a quarter Rotrieller. The result was a huge dog with good temperment but with definite guard dog tendencies. A Giant Schnauzer. After consulting with his wife, Carol, Jim gifted this beautiful, AKC registered dog to me. Jim and Carol had paid $800 for the dog--the prices I saw were more in the $1,000-$1,500 range--as a pup. They brought the dog home and, for the most part, confined him to a new pen off their rear deck. He had not been obedience trained and was not used to a one-on-one, in house association. He was like a two-year-old child. A giant two-year-old child. He would not only jump up on Julie and I but he would also jump from chair to couch to another chair. He jumped over tables. He jumped on the beds. He knocked things over. A mule pulled less than Gunner did on the lead. He was wild! He is so tall he looks down on the table and so far has managed to steal a slice of toast, two strip steaks and a meat loaf. He did this without our seeing him. He is one slick food thief! Thats the bad part. Is there a good part? Thankfully, yes! My dogs have always excelled in Obedience Trials. I have the "touch" when it comes to training dogs. Here he practices the 5 minute long down. He is now calm and quiet in the house, stays off the furniture, leads gently, walks at the heel, sits-and-stays and down-and-stays and jumps over obstacles on command. Here he shows he knows how to sit. He pees and poos when and where I tell him. I've taught him "Home". On command he runs out to take a pee, comes to a sliding squat, does his business and makes the gravel fly as he launches himself for "Home". Yes, he gets a treat at the door. Or, at least he used to get a treat but now mostly just settles for an "Atta-Boy". I take him where he can poo without having to pick it up--not in a neighbor's yard. HA. In this picture he is searching for the "POO" spot. I can't see him at night but know when he has finished as I've trained him to come running straight to me, sit down directly in front and look up. Yup! It's treat time again. I know, but he does it faithfully for a wee bit of turkey. He gets fed the best lamb and rice dog food twice a day but must sit and wait until I tell him he can eat. Then he must eat his food between my feet. At first he wouldn't do that. He'd take a bite or two and off he'd go. I immediatedly dumped his food. Like I said, he is a fast learner and hunger is a great teacher. He now sits quietly until I tell him he can eat and then quickly licks his bowl clean before I can dump it. HA! He had an ear infection. The vet treated him, gave me medicine to put into his ear every day for a couple weeks and then I'm to have him reexamined. He also got all his shots, a flea treatment and blood drawn for a heart worm test. I plan to continue to work with him for the rest of the year and put him in obedience classes in January. I know how to train him but I need to socialize him to other dogs and people and teach him to compete against other dogs in the ring. I hope to get a CD and a CDX with him before we're through. Bye-the-bye, his registered name is "Pierce's Knight Hunter" and he was called "Hunter". I just couldn't get my tongue around that name so called him "Gunner", eventually "Gunnie". Thats the nickname of a Gunner's Mate in the Navy or a sergeant in the Marines and I think a good name for a guard dog. People with dogs live longer. At coming 79 I need all the help I can get. HA. Actually I have greatly increased my exercise as I excercise and work him. I do have a sore, left hip but am gimping along like Grandpa McCoy. I also needed some responsiblity, something nearly 20 years of retirement has eliminated. All the "good" guys in the neighborhood have commented on the dog's good looks and what they believe to be his training. The "bad" guys in the neighborhood haven't commented but I know they have seen him and will conduct themselves accordingly. I work with dogs but wouldn't want to mess with a dog like this, believe you me! Bring on the Obama winter. I'm ready. "With the exception of women, there is nothing on earth as agreeble or necessary to the comfort of a man as a dog". Gunner is a very handsome fella! Glad the training has gone so well. I know he must be a joy. Love the name (both of 'em)!